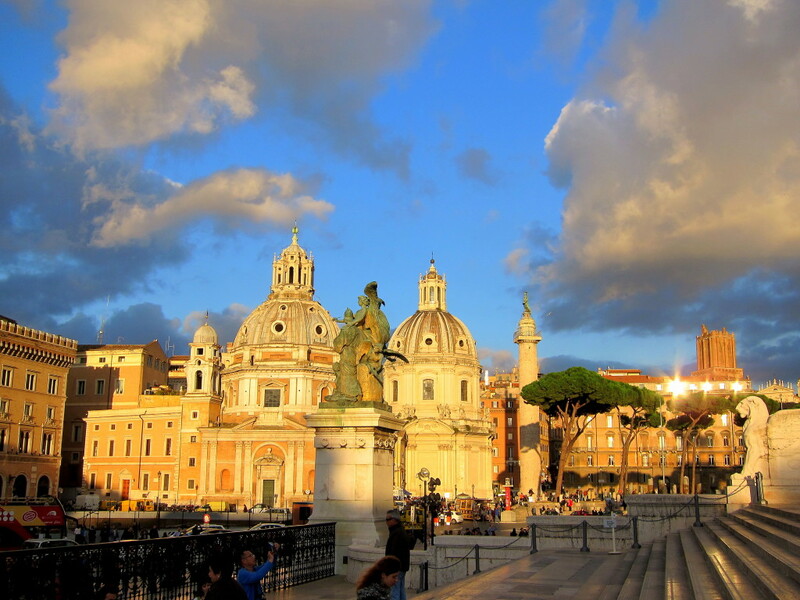 But there were a few parts of Rome that were just so breathtakingly beautiful that they stick out in my mind. These were the areas I couldn’t get enough of, and I had to come back to the next day to take it all in again. 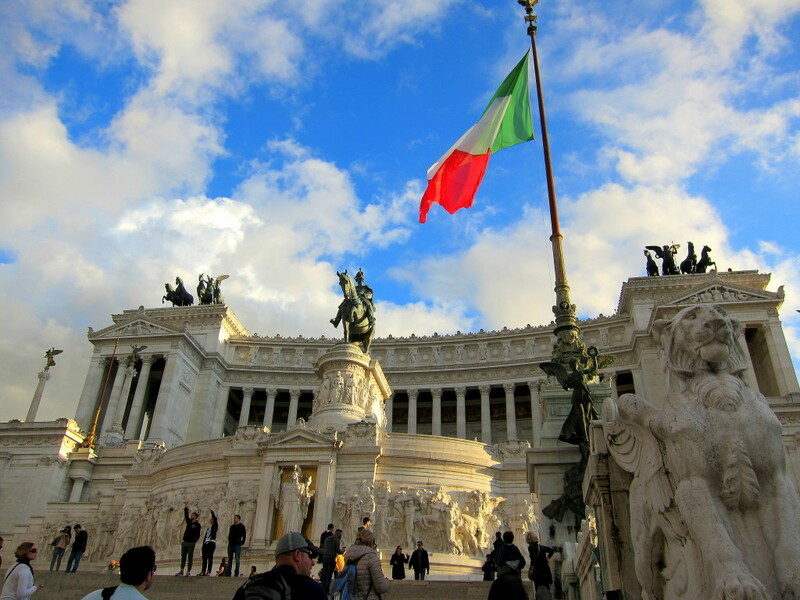 My favorite building in Rome was the Vittorio Emanuele Monument, also known as Altare della Patria. It was JUST. SO. MASSIVE. And so beautiful and pristine looking too! Inside the building is an art museum (we didn’t have time to go in), but just being near the building and walking up the steps made you feel like you were walking on something incredible. I was in awe of this building, and the views from the top of the stairs. 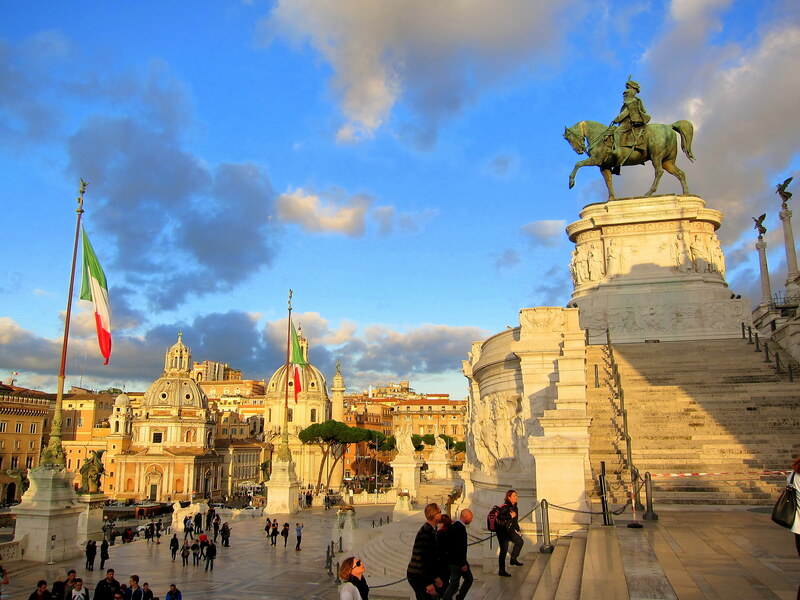 If you get here right before sunset, the light reflecting off the white marble and the golden buildings is incredible. 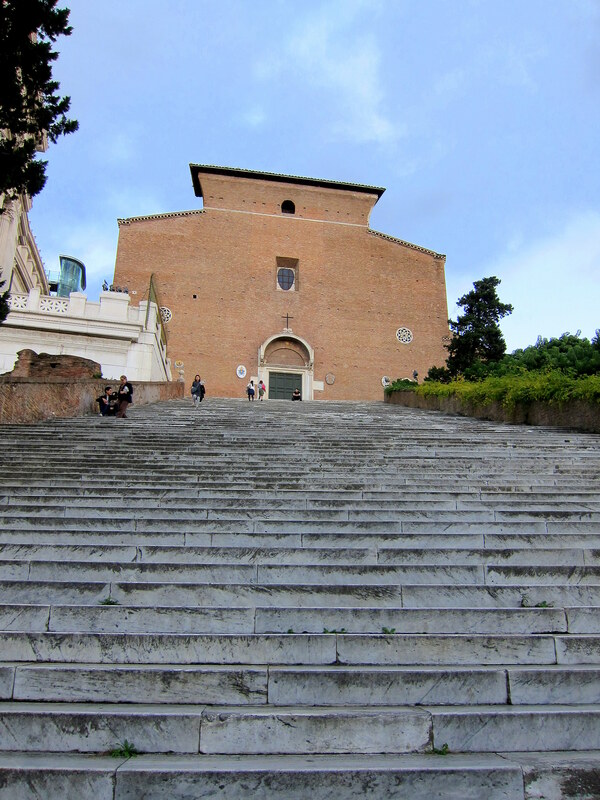 And the crazy thing is that right next to this relatively modern building is this ancient looking church from the 12th century – Santa Maria in Aracoeli. The church is on top of a huge set of stairs, and it looks so plain from the outside. But inside is just like any other cathedral in Rome – beautiful extravagant interior with frescoes, sculptures, and a super fancy ceiling. I love how so many amazing sights in Rome are so closely stuck together like the Vittorio Emanuele Monument building and this church. 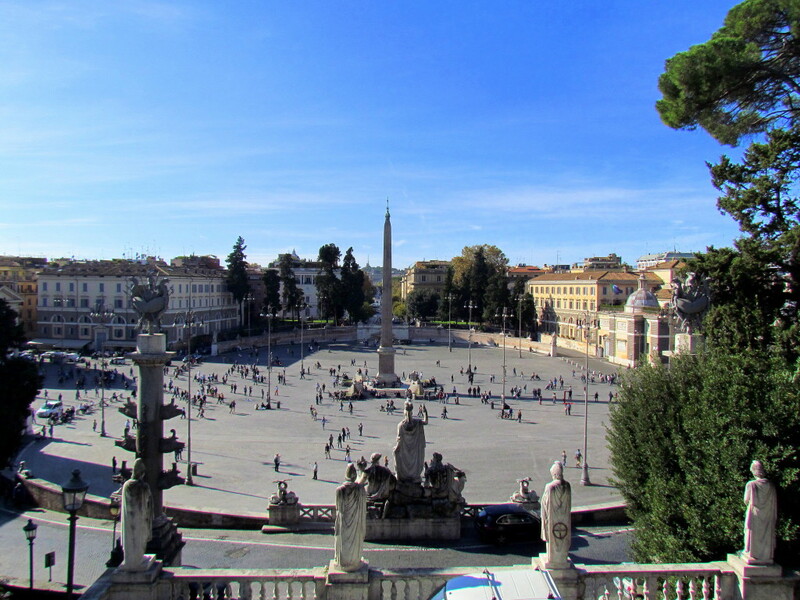 Another highlight from Rome is the Piazza del Popolo. 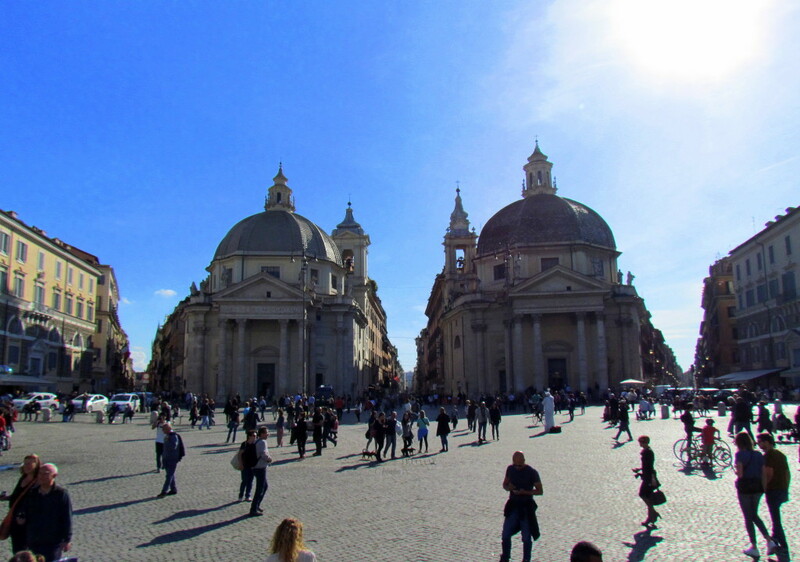 It is such a huge piazza, surrounded by beautiful churches and architecture. We were there on a beautiful sunny day, and the atmosphere reminded me of Central Park a bit – there was lots going on. Some people were there with their toddlers, some were just passing by; there was a street musician, and even a giant bubble blowing guy! I love people watching, so we got some gelato and sat at the steps of one of the churches and took in the atmosphere. 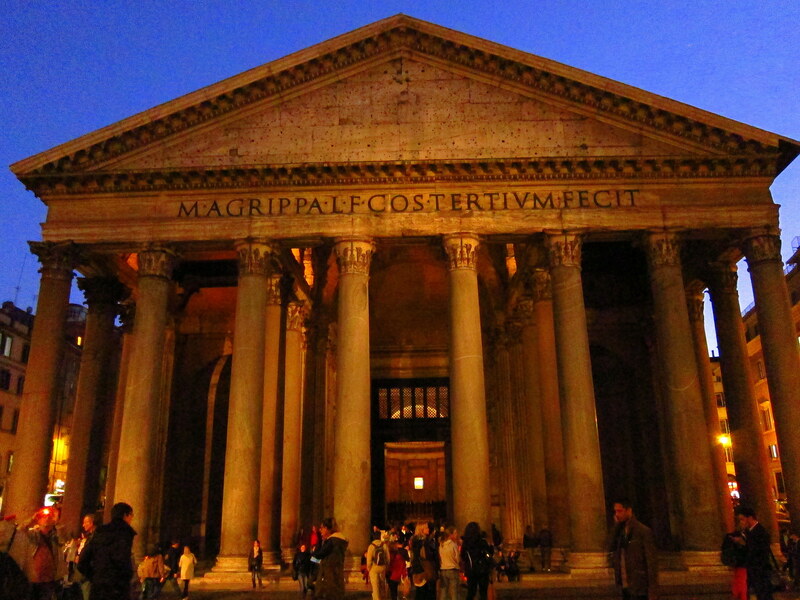 The other building that really stood out to me was the Pantheon. 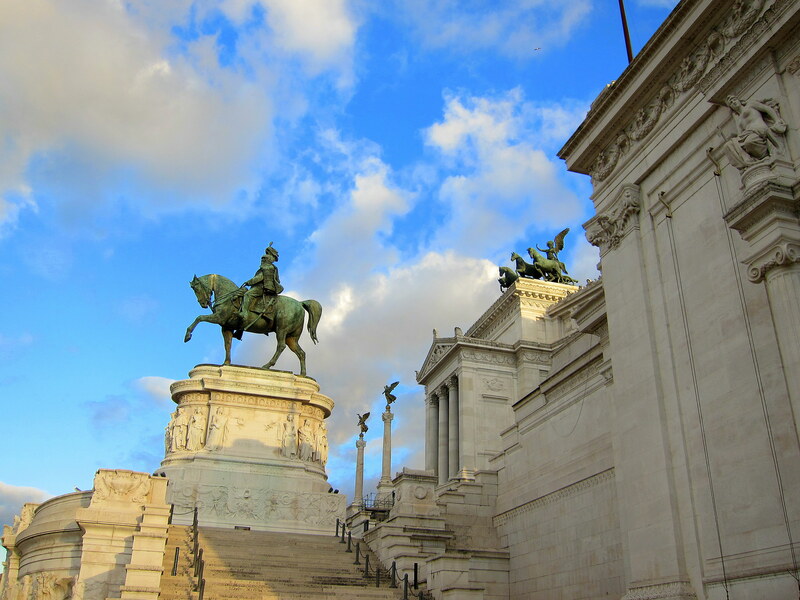 Not surprising, since it is one of the “must-see” things in Rome. 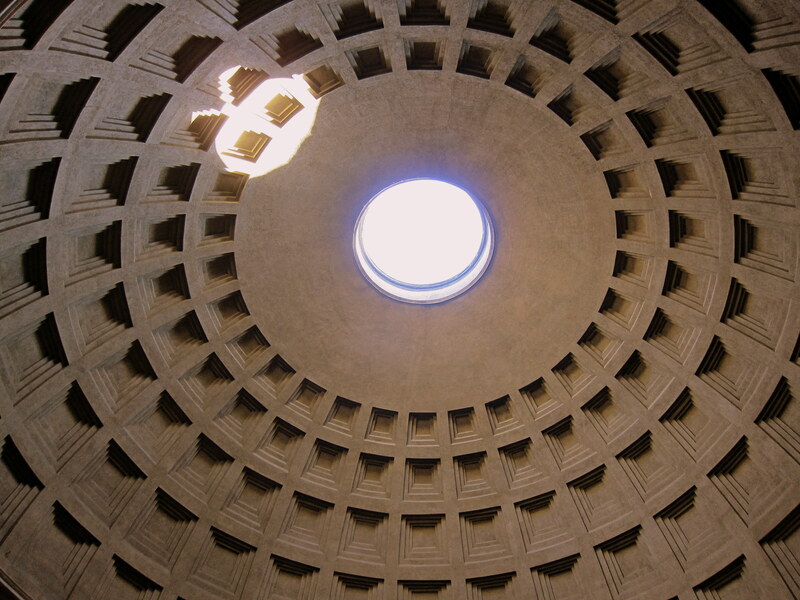 But I would have loved the Pantheon even if it wasn’t listed in every travel guidebook for Rome. 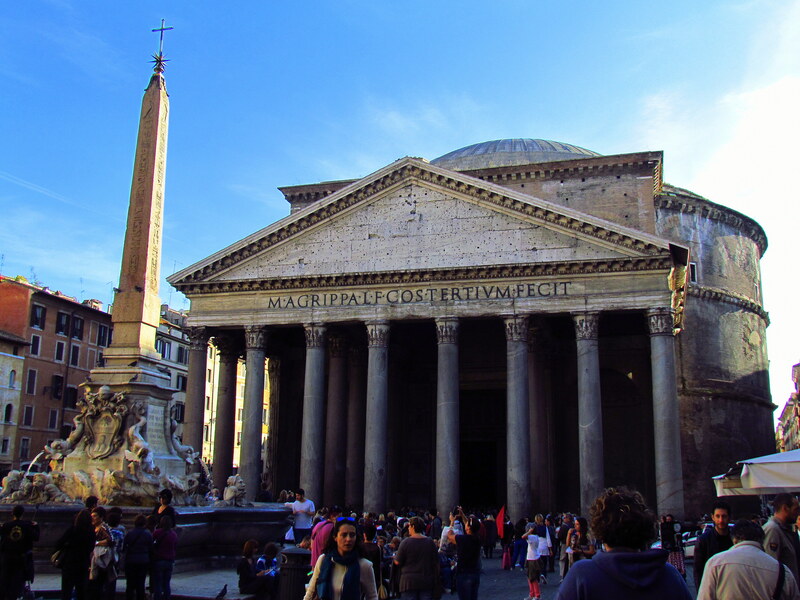 The first time we saw the Pantheon it took us by surprise – we turned the corner and saw a regular piazza opening up before us… and all of a sudden there is this obviously ancient building. The pantheon really did have an amazing vibe to it, you knew you were standing next to something that has so much history. 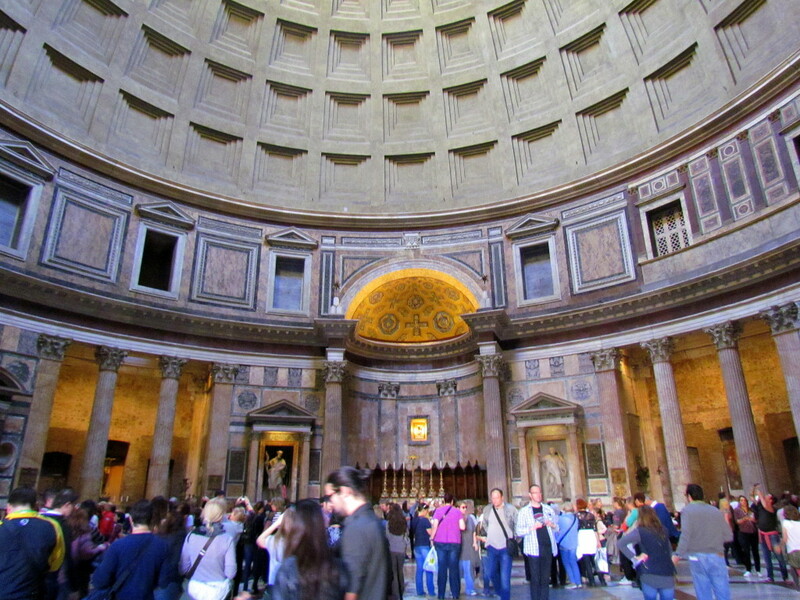 When we stepped inside the Pantheon, we were able to really appreciate how massive the building is. 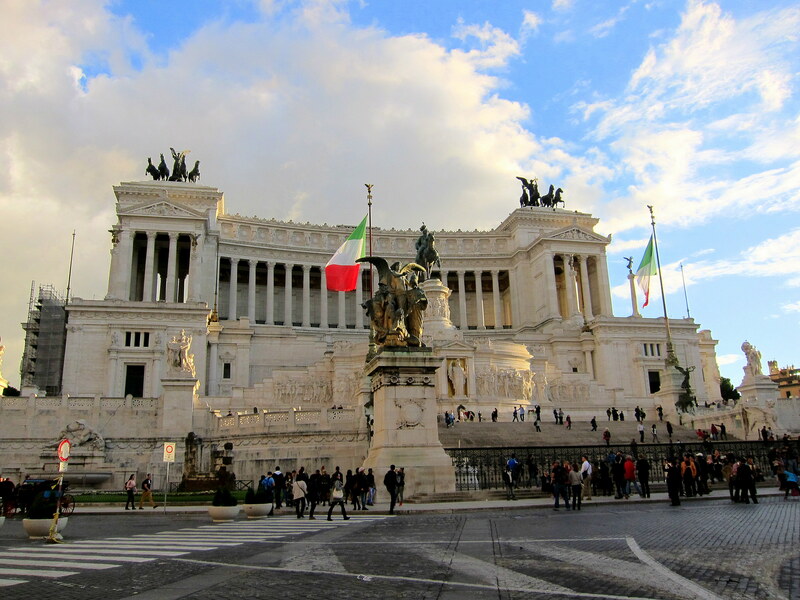 It didn’t look as massive from the outside, since everything in Rome is pretty massive on the outside. Unfortunately there were so many people in there that it took away any possible holy feeling you were supposed to get from it. We came back to the Piaaza della Rotonda at night too, and that’s when I definitely knew that it was one of my favorite places in Rome. 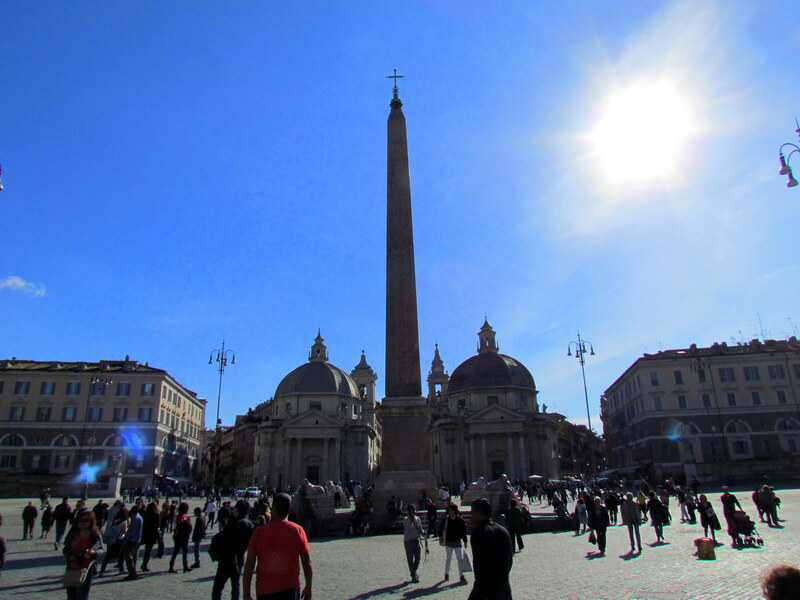 We sat on the steps of the fountain with the obelisk and people-watched. It was great to see the contrast of the old majestic building and the modern life happening all around us. There were families with kids there, people playing acoustic guitar in the piazza, others having dinner in the restaurants all around the piazza – there was so much life going on all around this ancient building, and it was nice to sit down and rest our feet and watch everything going on around us. Have you been to Rome? What were your favorite parts?